The water-view restaurant HUMMINGBIRD, is an energetic bar and kitchen inspired by the American spirit of cherished traditions: Clambakes and crab boils, fish fries and oyster roasts. Parties and receptions on the waterfront. Enjoy the award winning restaurant and view! Seats 24 guests in comfort. House made cocktails, vegetarian fare and seasonal savory seafood! Table of 6 for tasting menus and wine pairings. Signature Hummingbird Cakes in mini party form! 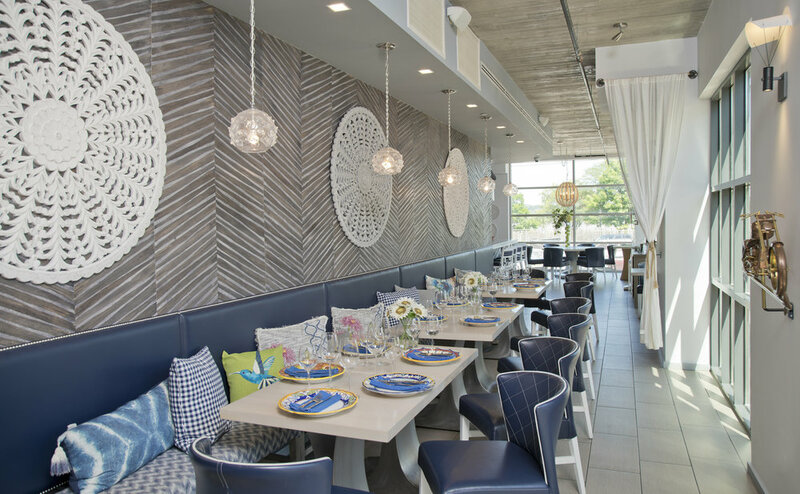 Award-winning Chef Cathal Armstrong and the creators of Restaurant Eve, present Hummingbird - the newest restaurant located within the Hotel Indigo on Old Town Alexandria’s waterfront. The chic bar and dining room are imbued with a rustic coastal vibe, a navy blue and white color scheme accented with ash wood. Light linens and large glass doors allow for river views from both inside and on the patio that offers fire pits and blankets in the cooler months. The menu follows the rhythm of the seasons and celebrates the Seafood Pride of favorite coastal waters from Chesapeake Blue Crabs to Dublin Bay Prawns. A to-do list would embrace oysters on the half shell; bronzed crab-and-corn fritters; lemony lobster linguine; and whatever whole grilled fish is being offered.